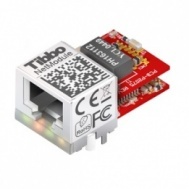 The EM203 is a miniature serial-to-Ethernet module. In combination with the RJ203 jack/magnetics front end (shown), the EM203 forms a complete Ethernet node occupying only 31x20mm (1.22x0.79") of the host board's space. The EM203 is compatible with Tibbo Device Server Toolkit (TDST) for Windows. TDST includes the Virtual Serial Port Driver (VSPD), which enables you to use the serial port of the module as a remote COM port of your PC. The Linux version of the VSPD is available as well.